Direct Parrots provide hand reared pet parrots and anything you’ll need for them. 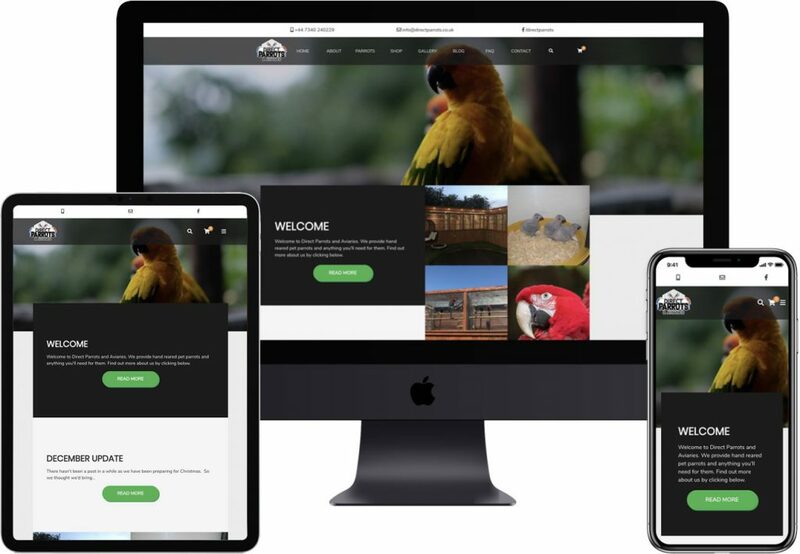 They are a dedicated and driven team of parrot enthusiasts with a strong network across the UK Ireland. The team had years of experience and were well know in the correct circles but had no online presence. They wanted to advertise and promote their birds but also support this with an online shop selling all kinds of bird toys, feed and paraphernalia. A full concept research and design. We created every element of the site in-house paying attention to UX and UI concepts with a strong focus on brand. We created a unique custom build in WooCommerce allowing only approved users to purchase birds – this required a huge custom WordPress development function of user creation, approval and notifications incorporated directly into the WooCommerce core seamlessly. Users, not wanting to buy birds, are able to carry out transactions without triggering the full review and approval function. Ability for Direct Parrots to control all stock from one control panel – both selling of approval required products and standard products. The ability for Direct Parrots to communicate effectively with users and potential shoppers via their blog.